Format: We begin with the “I CAN” cheer and a set routine of exercises. After this, the gymnasts are divided into 2 to 3 groups depending on the class size and rotate to different stations: mats, mini trampoline, and beam (if available). Gymnasts spend approximately 10 minutes ~ 15 minutes at each station. At the end of class all gymnasts come back together for a final “I CAN” cheer and good-byes. Take the Hibiya Line to the Hiroo Station and take Exit #3. 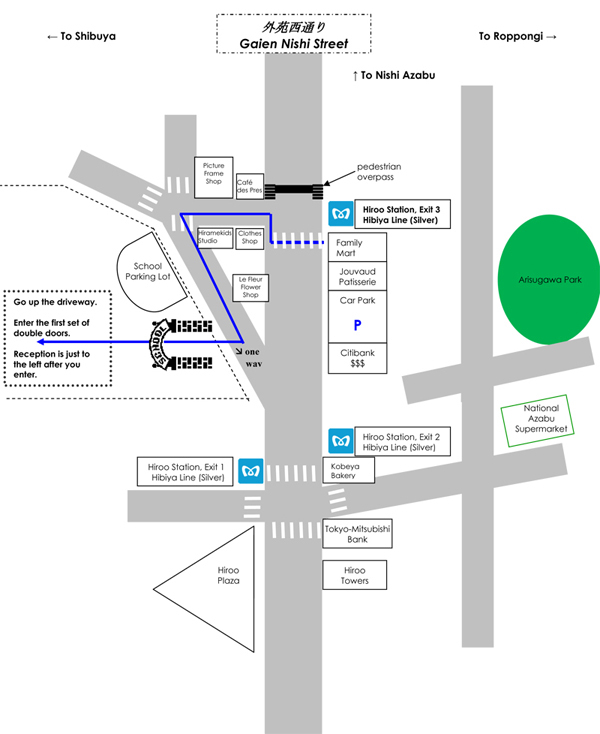 Once you have exited the station you will be facing Gaien Nishi Dori (street). Cross the street at the signal that is just left of the subway exit. Go straight and take the first left, which is a small angled street. The entrance to the school is through a parking lot, which is across the angled street from the flower shop. Enter the parking lot and take the driveway up the hill to the main entrance of the school.